WorldWorksGames • View topic - ***RELEASED*** Literary Error Goes Gold! Post subject: ***RELEASED*** Literary Error Goes Gold! "Scenic Encounters", this is a 3rd level encounter that pits the PCs against a rogue Imp and a horde of animated flying books. Made exclusively for use with Thoumont's Rare Tomes & Components. Last edited by Gamesmith Denny on 03-19-2011, 09:47 AM, edited 4 times in total. Which system does this use? Ah! Didn't see that. I really need to look more closely don't I. If I attack my players with flying books, they will beat me. I wonder if I can make a HOTT army of flying books and gremlins. Kind of a rules-lawyer swarm. Cheers for making me smile on a boring tuesday morning!! 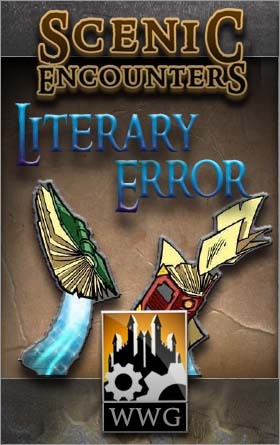 Literary Error is going to be our first step into the realm of 4E. It's quite a bit different from the module lines we've done in the past, and is the first in our "Scenic Encounters" line. The simiarities are that it is still based off of one of our existing modelsets, and that it will include standees. The main difference? It's not a full-blown adventure, it's a single encounter (some future ones may be a short series of linked encounters). Pricepoint is accordingly low, close to what you'd pay for a good kitbash. I really like the idea of a single encounter but my current group doesn't play v4.0. Will any v3.5 OGL compatible encounters be made? You could modify the monsters and use a similar concept and still use the minis. Absolutely. Depending on the complexity of the encounter I say 5-10 minutes once you've got the hang of it; swap the monsters (or find something similar) for the 3.5E versions, check the CR/ECL, and you should be good to go! Even unique monsters should be easy enough to convert; most stuff could be used right away. At last check (they may have backed this off), the licensing specifically forbids putting out a 4E product and a 3.5E equivalent of the same thing...which is why we're starting out our first moves into 4E with a totally different line instead of converting our old modules. SW, on the other hand, isn't completely out of the picture. I need to go have a chat with Joel about it. I wasn't suggesting that this one in particular be converted to OGL 3.5 or that there be 3.5 and 4.0 versions but rather that in the future if it's possible new products of this 'single encounter' format will be made for 3.5 or is WWGs totally moving into the 4.0 direction? That remains to be seen, morganm. I can't specifcally say either way right now. Oh my goodness I need to demo this sometime at the shop. I can attack my customers/players with books - just like in real life!! I look forward to this series of encounter-based nuggets! As a single encounter, I can see this being used as a great way to introduce people to 4e or D&D in general. You don't have to carefully make a character, since it will only last an encounter. You don't have to worry about making any mistakes that will cost you later, because the encounter is all there is. And you don't even have to worry about death because the encounter won't take up an entire evening. So anyone that has their character killed won't be sitting around doing nothing for very long, and they won't feel bad because they didn't really invest much in the character in the first place. Plus, it goes through most of the game mechanics needed for longer sessions or campaigns. I'm actually really looking forward to this, since I've never had any experience with 4e. I'll be able to cut my teeth on the new system. Its a shame they won't allow a 3.5e equivalent, since that would also bridge the game between the older and newer system. I mean, sometimes you need a quick go through to learn new habits and lose old ones, and going through with both versions could emphasize the changes. But that would offer a two-way bridge, and I guess WotC doesn't want people moving backwards. edit: As much as I'd rather see this for the more versatile and compatible (well, compatible with most of the stuff I have, so I'm biased) 3.5e system, I can understand WWG needing to explore 4e since that is where D&D is heading. And a single encounter's small enough to experiment with and see where things lead. edit 2: I got the sudden urge to re-create the library scene at the beginning of the first Ghostbusters movie, using some Mayhem sets and the flying books from this set. Heh. At least with our group it took more then one encounter for us to get into the groove of 4E.... It's a very different game then 3.5E, so we had to unlearn a number of things. It really took us about 4 full sessions to really get into the flow. next he will be saying that Hexes are better than grids. and chits in a cup instead of dice? I wouldn't even mind if it's not TLX.